Thanks to an enhanced focus on healthy living, people have become increasingly more attuned to eating well. This means cutting out junk food, controlling indulgences and for the most part, following a balanced diet packed with nutrition. So it’s not all that surprising to see these practices, in turn, branching off into several other areas. Juicing is one such variation, and one that is quite versatile as well. And to do juicing right, you’re bound to need a good juicer. Making a decision about which juicer to buy though, is a whole other ball game. It should, therefore, be in your best interests to grab all the juicy details for yourself by researching of course. If you need any more motivation, just think about waking up to a glass of delicious, freshly squeezed juice of your liking. You can even make a batch and leave it in the fridge to drink at any time! Add healthy greens like kale and spinach to your favorite fruit juices and enjoy major health benefits thanks to nutritious vitamins and minerals. And for a Friday night in, fruit juice mixers of course! We’re quite convinced that right about now, you’re ready to bring home that juicer to try out interesting combinations. It can be confusing and even overwhelming to browse through the multitude of options out there, but that’s exactly what we’re here for. Breville is a reputed and popular household name, owing to its superior quality and therefore high customer satisfaction. Sturdy, durable and well-built, this juicer is worth every penny. Juicers need to be resilient, especially if you are a frequent user, which this one is. You also get to extract the best nutrients, as it retains the pulp which is rich in fiber. This Breville juicer comes fully-equipped with an electronic 5-speed dial that’s responsible for maximizing juice yield, which means you always get more bang for your buck. The powerful 1200 Watt motor and heavy grade die-cast metal body speak for themselves. The Nutri Disc also allows you to get through the tougher fruits and vegetables with ease, so you tire yourself less, while the puree disc is for softer ingredients. If you find it annoying to deal with chopping up fruit all the time, well, fret not. They have even thought of that, including a 3-inch feed tube that eats up whole fruits without a problem. Did we mention that clean-up is a breeze? As durable and reliable as they are, they may not be practical for people always on the move since the appliances are cumbersome and bulky, making portability very difficult. Available in both black and white, this juicer by L’Equip is ideal for anyone on the lookout for a powerful juicer. Some traits that we think are quite useful include the 2/3 horsepower, 480-watt universal motor, and the 3”, extra-large feeding tube which is perfect for juicing whole fruits. 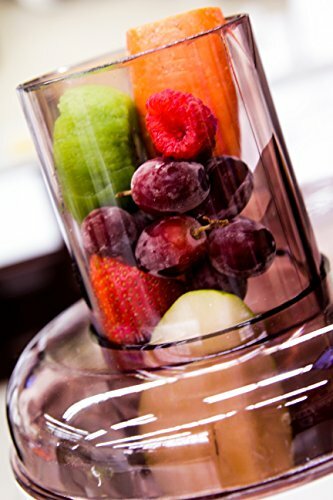 No more spending time chopping up fruits every morning for a glass of fresh juice! Well, aside from the motor promoting maximum juice extraction, this beast comes complete with a patented, automatic pulp-ejection system. They’ve even included a large pulp container for convenience. So enjoy juicing without the clogging. You’re also assured of safety, thanks to their safety latch system which exercises maximum protection when both setting up and juicing. You get to take advantage of an industry-leading 3-year warranty on the blade baskets, on top of another 10 years on juicer parts. Any issues that may crop up are therefore taken care of for you. 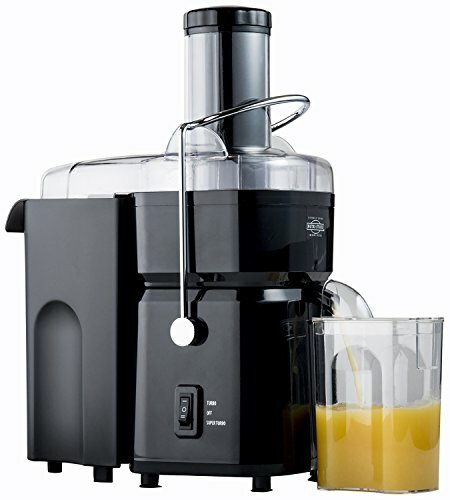 Step into a healthier lifestyle easier than ever with regular juicing practices complete with a well-equipped juicer. With this one super easy to clean as well, there’s nothing to worry about. 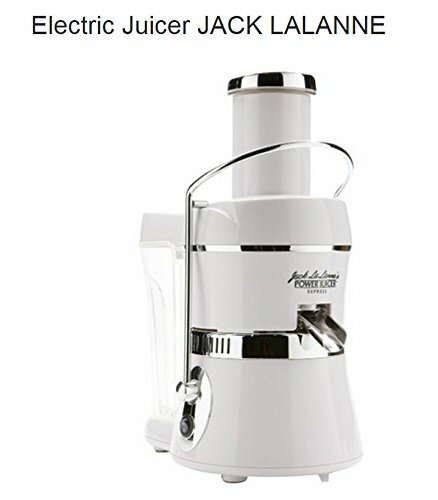 Sleek, stylish and utterly sophisticated, this Jack LaLanne juicer looks every bit as elegant as it sounds. It’s also comparatively more efficiently designed and is therefore less bulky. For those of you who want to get into juicing more but don’t want to deal with hauling bulky juicers all around the countryside, this is the perfect fit. Its simplicity and efficiency make juicing a breeze. The ample 68-ounce capacity means that you can juice ahead, making juice in batches for yourself and your family. Ideal if you’re super busy as well. Additionally, you can look forward to a hassle-free clean-up process, as it comes fitted with dishwasher-safe parts. Save time and energy with this handy machine. Along with the juicer, you’ll also receive a bunch of recipes and an instruction manual for proper care and cleaning. Get ready to whip up a selection of refreshing juices within minutes right from the comfort of your own home. We recommend looking up plenty of other recipes and juicing up for a healthier, more invigorating lifestyle. Get your daily serving of fruits and vegetables with the simple habit of juicing. We did say Breville was a famous household name, and this just proves it. 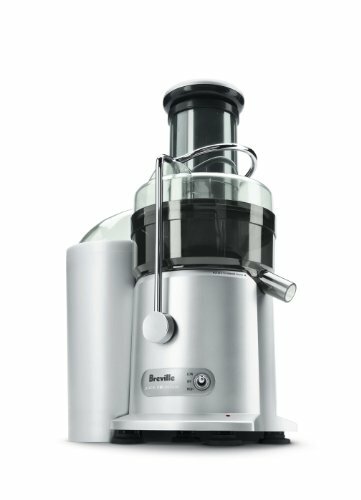 We have a second Breville on the list under Best Juicers. If you’ve been looking for something that’s budget-friendly yet packs a punch, this could be it. The extra-wide 3” feeder chute is incredibly beneficial, yielding around 8oz. of juice within a matter of seconds. No more wasting time and rushing through your mornings without something substantial in your stomach. Its well-designed setup allows for the easy extraction of up to 30% more juice and up to 40% more vitamins and minerals when compared to other juicers in the market. But of course. Its 850-watt dual-speed motor and stainless steel cutting disc mean that fruits and vegetables are pulverized to perfection, ensuring utmost efficiency and effectiveness. The large pulp container is on-hand to catch all the residue. What’s more, they’ve put a lot of thought into the safety aspect of it, by fitting it with not just a safety-locking arm, but also an Overprotection Load LED. The dishwasher-safe parts and 1-year limited warranty are also points worth noting. Though this isn’t the most inconspicuous juicer on the planet, it’s definitely quite a specimen, and is also quite economical. This 700w fruit and vegetable extractor is undoubtedly a force to be reckoned with, and ideal for those who love drinking fresh juices throughout the day. In addition to this, this juicer comes with a high-efficiency stainless steel micro-blade that’s able to extract up to 33% more juice, as well as 40% more nutrients full of vitamins and minerals. You can also make use of the extra-large feeding tube, measuring in at 72mm wide for larger pieces. Less time-wasting and mess, which is always welcome news, right? They’ve also included a safety-locking arm, which is beneficial if you have young children in the house. This stops the operation of the juicer until the cover is in place. Well, the parts are dishwasher-safe which means this juicer is easy to clean, and if you happen to run into any trouble, you can make use of your 1-year limited warranty offered on every sale of this juicer. Built for durability and resilience, this juicer is excellent for families who love their fair share of juices, and will set you on an exciting new journey with ease. You don’t need rocket science to narrow in on a proper juicer for your needs, but it can’t be denied that being a little wiser can never hurt. As you may have noticed, you need to look at several different things, from motor speed to power, build material, durability, portability and how much juice you can hope to extract, to name a few. If you want a juicer with less noise and a more compact design then you need to make a note somewhere in the back of your mind to check these out. The last thing you want is to spend way too much time fiddling about with your juicer every time you need a fresh glass of juice. It should be easy to not just take apart but also to put back together. This means that you have to look for something that’s well-designed and built, so it’s easy to clean once you’re done as well. If you want to be able to control the type of juice you yield, then you want to go for a juicer with variable speed. If you come across juicers with one speed, that means the juicer is masticating and triturating. Your efforts would all be quite useless if your juicer doesn’t yield the kind of juice you want. So if you can find out the nutrient percentage you can expect, that would be a good indicator. Seeing as how fruits and vegetables are packed with vitamins and minerals, it only makes sense that this is a key point of focus here. This is a critical part of buying a juicer, so make sure you look for this feature when you shop for one. You need external pulp ejection when juicing more than glass for sure, and this is essential for its functionality as well. Try to get your hands on a juicer that comes with a sizeable pulp container. Quality: You want a sturdy juicer that’s high-quality and durable. The frame should be strong, and it should include proper stainless steel parts as well. Feeding chute: Nowadays, people simply don’t have time to waste cutting up fruits especially if they drink juice frequently. Which is why you need a wide feeding chute for larger pieces and whole fruits. Motor: The size and power of the motor are pretty much what determines the power of the juicer. Look for the most powerful motor within your price range. Else, it will burn out before you know it. Noise: Bear in mind that some juicers can be quite loud, so if this is a problem, you need to look for something quieter. Warranty: If you opt for a reputed, well-known name in the market, you may initially glance over this, but never do that. Always check on the warranty, and ensure you have it in place. There are juicers that differ in pricing and characteristics, and the more streamlined, silent appliances are generally more expensive than the rest. So you should first know what exactly you want from your juicer before setting your budget. 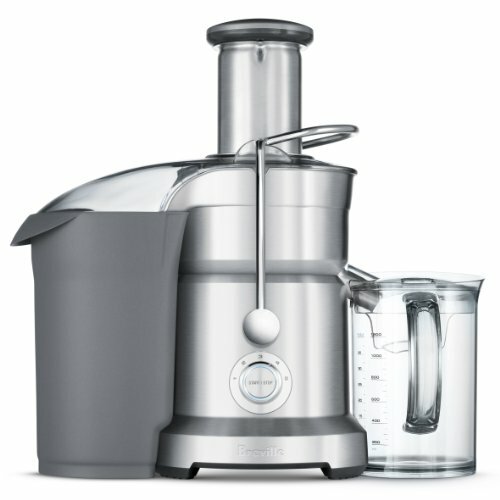 If the juicer is a little above budget, check to see how many additional features you get with it, and what they are. They could be worth the extra cost. Wrapping things up, it’s fairly obvious that when you’re in the market for a juicer, you have to check on several different things. Seeing as how there are just so many options in terms of types and brands out there, it’s more important than ever to be thorough in your research as well. Might we suggest taking along a pro-juicer expert along with you? Maybe a friend or family member? We should also add that there are deals and offers periodically as well, so who knows, you may even be able to get your hands on a great choice at a budget-friendly cost. On that note, be sure to buy a juicer that’s right for you. Just because Aunt Suzie’s seems to work for her just fine, doesn’t mean it would be right for you, so dig your heels in and get cracking on it!